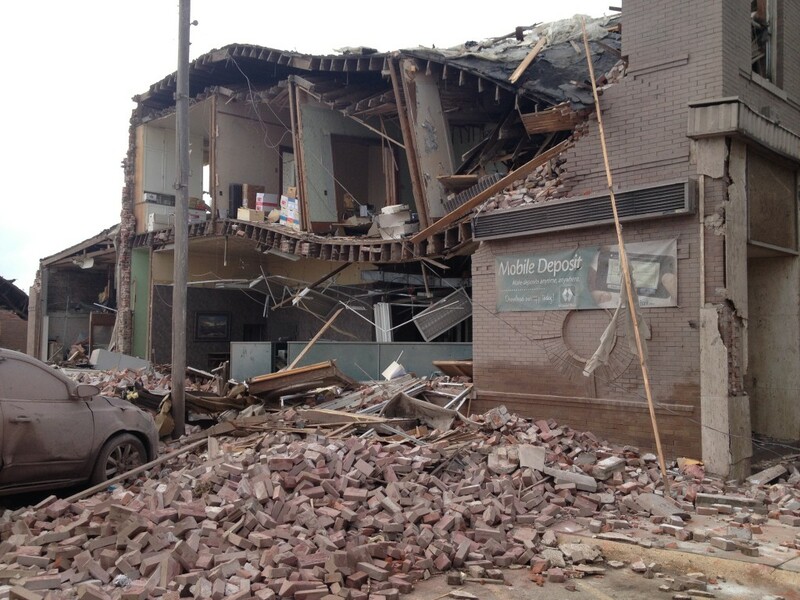 Midwest Bank's Pilger, Neb., branch after the tornado. Editor’s note: In June 2014, two tornadoes struck the small town of Pilger, Neb. The tornadoes killed two and critically injured twenty more. At Midwest Bank’s branch in Pilger, market president Gene Willers followed the protocols for a tornado alarm and led his staff of to the vault—the safest space in the bank. They then realized the vault door could not be locked from within. To protect his employees, Willers closed the vault door and took shelter in the bank’s basement just minutes before the tornado struck. The winds sheared a wall off of the bank, destroying the building, but Willers and the employees in the vault were kept safe. At ABA’s National Conference for Community Bankers, Willers shared several tips from his experience for bankers facing a natural disaster. Every one of us in some capacity has worked on a disaster recovery plan. In most cases, the plan itself is good, but there are one or two parts of the plan that really count. We take the necessary steps and actions in preparing for the worse, but I truly believe we really don’t think it will happen to us until it does. Our CEO’s first reaction in responding to this event was to consult our contingency plan. The plan delineates who does what, when, where and how. Until you’ve executed the drill, the plan isn’t complete. It’s amazing the flaws you will discover—as we did. Periodic practice runs, especially with younger staff, are essential. If you are unable to reopen immediately, you will need a temporary site. We opened in a neighboring town in an empty store. Underlying this I would say: Know your insurance agent, carrier, and your coverage. Know the insurance limits, inventory your personal property and maintain an up-to-date list. Midwest Bank’s Pilger, Neb., branch after the tornado. It’s important to communicate within your organization and to know the plan of action and have the security firm identified, as well as the contact information for your safe and security systems. Don’t forget to keep the remaining bank’s staff informed and to keep everybody up-to-date on the event, on volunteer opportunities and the recovery process. Designate who is authorized to speak on your bank’s behalf and have that person’s contact information readily available to the media. Constantly repeat your message in interviews. A 20-minute interview can result in a 10-second soundbite on local news. Keep your patrons informed. Don’t gloss things over. They need to know that the bank will survive and that their assets are safe. Most importantly, they need to know where and how they can do business with you. The media can be demanding, but use them to get your message out. After the event and during the prolonged recovery, limit interviews to designated contacts and have a consistent message. Be aware that interviewers may have their own agendas, so keep on task with your message. Monitor social media closely—I can’t emphasize that enough. Every politician will want to be on site. This is an opportunity to get your message across because of the media associated with these visits. This helps you weed out who is there for publicity only. As so often happens in a small community, the bank employees will assume a large role in the recovery process. Be prepared to lessen their duties and allow them time to meet those community needs. Our staff was meeting with counselors as a group and individually within a week of the event. Staff from other bank locations was allowed paid leave to volunteer in the cleanup process at our branch and in the community. Contact others and get references for accounting and legal firms that have experience in dealing with federal and state emergency agencies. Be ready to offer your local officials resources as well. And think about how you can help down the road. Joplin, Missouri, which had suffered its own deadly tornado, was one of the bigger communities that offered a helping hand in a kind of pay-it-forward atmosphere. This resource was invaluable. The banner for their campaign to support us was in place within two weeks of the event as a reassurance to our community. It’s a guarantee that we live on. Gene Willers is president of Midwest Bank’s branch in Pilger, Neb. He was named a Citizen Hero by the American Red Cross for his actions to save the branch staff during the tornado that struck Pilger.